Featuring: Chad Carter (vocals), Aaron Graves (piano), James King (bass), Jeff Neal (drums), Paul Bailey (trumpet) and special invited surprise guest(s)! Option 1 ($110)- includes music & dinner in JazzKnights Club, VIP seating. Option 3 ($50) -includes music show ONLY, does not include dinner. Open seating. Note: Party favors included to bring in the New Year!!! Option 4 ($125) - includes music & dinner in JazzKnights Club, VIP seating. Option 6 ($75) -includes music show ONLY, does not include dinner. Open seating. Click on TICKETS on the bottom left menu for more details. Great Music, Great Food, Great Fun!!! You will be in receipt of a Live Music Concert by Washington DC area's finest Jazz musicians. But it doesn't just stop there...which it certainly could! or you can Pick & Purchase what you would like to eat and drink, A la carte. 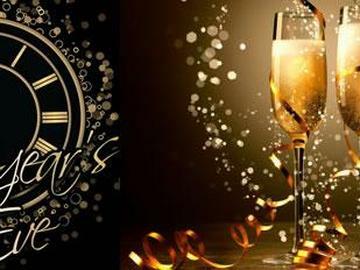 Note: The Late show includes, Party favors, DJ dance party, and complimentary champagne toast to watch the ball drop on our jumbo HD projection screen to bring in the New Year!!! So what's a party without dancing?!? then, we have one of the area's hottest DJs spinning the sounds and grooves to make your body move. Celebration Confirmation to provide pertinent party information!! New Years Eve Party and Performance! Live Music, DJ, Party Favors and Champagne! One of your own home grown male vocalists, straight out of Washington DC, none other than Mr. Chad Carter comes back to newly established jazz venue, Alfio's! Buying tickets early is highly recommended as seating is VERY limited! Treat yourself to a great evening of music that's sure to please. We promise you will leave wanting more! Oh yeah, the Italian cuisine is excellent as well and the price is right! See you there! You must have a printout of your ticket(s) for entry. All sales are final, no refunds. Tickets are not transferable.